Alaska Airlines matched a Delta price from yesterday AND dropped it another $15 down to the lowest price I have seen out of NYC ($384). Alaska Airlines also offers a free lift ticket at Alyeska Resort when you fly into Anchorage ($60 value), just show them your Alaska Airlines boarding pass the day of arrival) and you are good to go. Philly deal yesterday — NYC gets in on the AK action today. In addition to the above free Lift Ticket (from Alaska Air) Alyeska Resort also has a pretty solid midweek deal using PromoCode SKIFREE — where booking one night mid-week gets you two full day Lift Tickets. I ran through the checkout and the code does still work (even though it came out last year). Here are the full Alyeska mid-week deal details. For anyone bringing the family (or the whole crew) Trivago has two and three bedroom ski-in-ski-out condos from $175/nt (40+% off). PLUS Chugach Powder Guides partnered with / leaves from Alyeska and has 27.5% off Cat Skiing when you sign up for their Stand-By program. 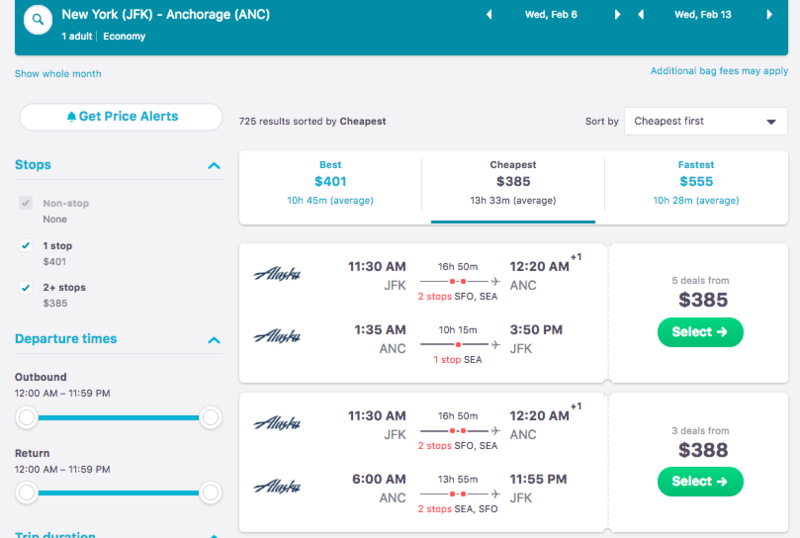 New York to Anchorage is generally around $700 round trip — these cheap ski flights save 45% and get you there with One Stop on Alaska Airlines. Really the only caveat here is that the availability for the Single Stop (each way) in Seattle flights at $384 is super slim — and primarily goes down in December. There are a LOT of $400 RT flights with the one stop or alternately a bunch of $384 flights that have one stop on the way back (but an additional second stop in L.A. on the way there). I'll pay the $15 extra and skip a stop in la-la any day of the week, but you do have options for sure. On that note Alaska Airlines also has $400 RT flights out of Philly for anyone who is closer to that side of things. If you can't be bothered with the lift, Heli is a legit option too. That $300 per person savings on the flight in might not quite cover it — but certainly won't hurt either. Since Cat (or Heli) Stand-By is free, and zero obligation, it seems to me that it's worth doing — if only to see what the conditions look like while you are there and then decide. Leaves Alyeska around 8am and gets back at 5 or 6 pm (lunch, snacks etc included). Generally this deal starts in December and runs through the end of February. March are much more expensive (the cheapest I found in either was $590 — still a decent price but way more than $400 in January or February). United Airlines and Delta have matching prices and more LGA availability but Alaska Airlines' best prices are generally out of JFK. When using the dates below BE SURE to pick Alaska Airlines from the results when you book. That will get you the better stop (Seattle) and also the free lift ticket — whenever Alaska Airlines officially confirms their Ski Free program this year which I expect to happen shortly (it has been running for 3 years now — and the exact same late promo confirmation happened last year).